Eyebrows: With time the soft fatty tissue beneath the eyebrows shrinks and because of gravity it droops. Upper eyelids: The skin around the upper and lower eyelids stretches as we age. This happens from washing, rubbing, putting on and removing makeup, which not only stretches the skin but also leads to mild to severe droop of the upper eyelids. Lower eyelids: The skin on the lower eyelids also stretches with time. The tensile strength of the eyelid decreases which results in a mild to moderate eyelid droops. Orbital fat protrudes which leads to “puffy bags” on the lower eyelids. The volume around the eye also decreases leading to “hollowness” around the lower eyelids. Midface: Loses volume and descends. Lips: Get thinner and lose volume. 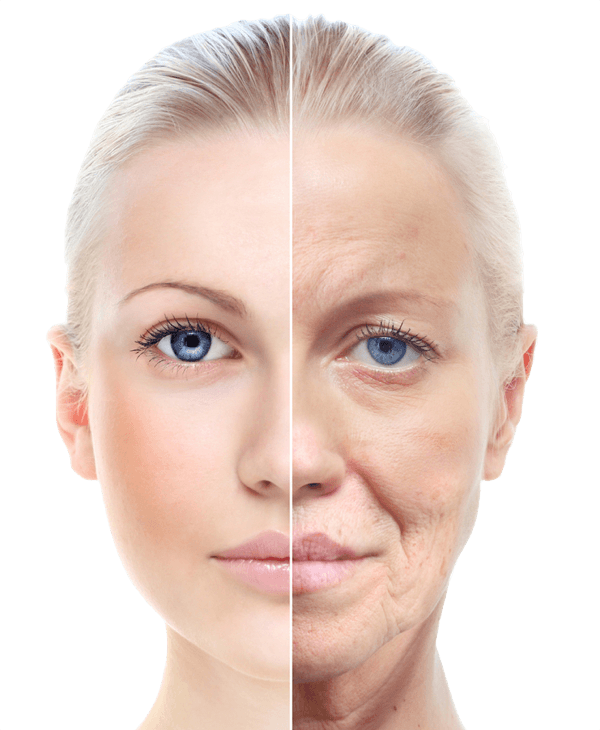 Generally speaking as we age we lose a significant amount of volume around the face. That volume loss is evident not only in the soft tissue but also with the deeper bony structures. An analogy for this would be a balloon which when fully inflated is smooth and tight, representing a young face, but as it deflates it becomes softer and wrinkly, representing an aging face. Gravity also plays a role by pulling the soft tissue down. The skin loses its tensile strength and becomes lax. Chronic sun exposure and other environmental factors damage the DNA over time which in turn decreases skins ability to repair itself. Some people are lucky and are born with good genes and they “age” very well. We don’t have a choice in the genes we get from our parents, but there are number of things we can do to help slow down the aging process. If you try these tips below and still feel you would like to change the age of your face, cosmetic surgery may be a great option for you. Sun protection: The first thing I would recommend is avoiding and or limiting sun exposure. Applying and reapplying sunscreen with SPF 30+ with UV A & B protection on a daily basis is important. A diet rich in antioxidants is also key. You can find these in green vegetables. Generally speaking avoid foods that are high in sodium and preservatives. Unfortunately we are exposed to 10x the amount of salt that we need every day. Salts and preservatives lead to more fluid retention around the face which in turn leads to more stretching of the soft tissue. If you wake up some mornings and your eyes and face look puffy and swollen, ask yourself what you ate the day before and try to avoid those types of foods as much as possible. Avoid excessive rubbing of the eyes and face. As you can imagine this will stretch your tissue and expedite the aging process. Avoid sleeping on your face or your sides. Some of the most beautiful 60+ year old patients I have tell me that from an early age they’ve made it a habit to sleep on their backs. I know this may not be very easy to do, but if you can learn to do it early on, it will make a significant difference in the aging process. Botox and other neuro‐inhibitors: The muscles in our face, like any other muscles in our body, will get bigger and stronger with more use. These muscles of facial expression are used on a daily basis every time we laugh, cry, eat, get surprised, frown or get angry. Initially as we use these muscles they give rise to dynamic wrinkles, which means they only present themselves when we are using that particular muscle group i.e. crow’s feet wrinkles with smiling or the frown lines in between the eyebrows when we frown. As we age and these muscles get stronger the dynamic wrinkles become static, which means they are present even when we are not using that particular muscle. Botox, when injected correctly, works by decreasing the action of these muscles, thus reducing the static wrinkles. My personal philosophy has always been that wrinkles are normal, and I’m not an advocate of a “frozen face”, to me it doesn’t look natural. Being in Beverly Hills we have a lot of actors and actresses that, because of their job, need to be able to express themselves and not be frozen. By use of micro injection techniques we achieve a natural “refreshed” look that is not “frozen”. Botox lasts 3 to 5 months. Facials: Every person should get a full facial that allows good exfoliation of superficial skin at least once or preferably twice per year. If you have concerns about your aging face, contact our office today with any questions or to schedule an appointment.